The SF5-K is to be used as a counterpart of School Form 5 used in Grades 1 to 10 of the K to 12 Basic Curriculum. The procedure of accomplishing the form does not necessarily differ with the School Form 5. 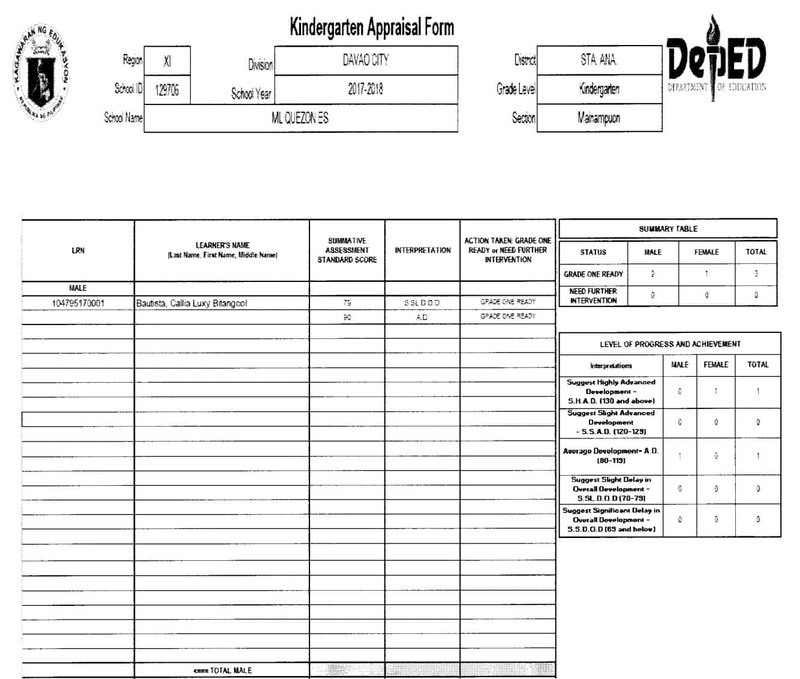 However, the summary tables and some data elements are specific only for the Kindergarten competencies. The LRN, and Learner’s Name (Last Name, First Name, Middle Name, and Name Extension) are of the same format with the School Form 5. The Summative Assessment Standard Score and Interpretation is based on the result of the Early Childhood Care Development Checklist. Action Taken column is to be marked as Grade One Ready or Needs Further Intervention. If the learner has a Summative Assessment Standard Score of 79 and below, then he/she is to be marked as Needs Further Intervention. On the right side of the SF5-K are the summary tables of the results based on the main table. Each column shall be marked numerically based on the total number of male and female on each row.